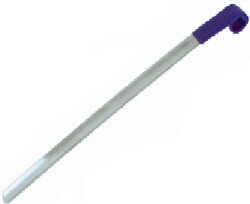 Don’t even think about bending to put on your shoes with this Stainless Steel Shoehorn! Ideal for people that have trouble bending, have problems with their back, or are recovering from hip or knee replacement surgery; not to mention a great conversation piece because of its extra long length! It’s available in 30, 24, or 18 inches, and features a curved, vinyl covered hand grip that can be used to pull up your socks. Due to the quality manufacturing, this shoehorn will last a lifetime. Order while they are still in stock!